Though AFP may disagree with the political views apparently held by this photojournalist and videographer who provided embedded coverage of the D.C. protests on the day of President Trump’s inauguration, he has the right to attend and report on controversial events. Nov. 27 marked the beginning of a trial being watched across the nation. Alexei Wood, a San Antonio-based freelance photojournalist and videographer, is facing multiple felony rioting and destruction of property charges stemming from his coverage of the chaotic and violent protests held in Washington, D.C. during President Donald Trump’s inauguration ceremony. If convicted, Wood faces up to 61 years in prison, according to his lawyer. Numerous groups protested against Trump’s election on the day of the inauguration, and many more protests followed during the weekend. 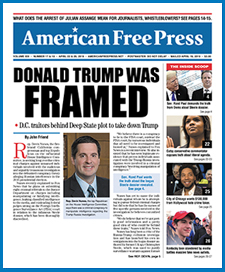 As this newspaper reported at the time, as many as 50 of the groups involved with organizing the protests, which turned violent, caused massive property damage, and created disruption and chaos in the nation’s capital, were directly connected to the infamous plutocrat and top globalist George Soros. Soros has a history of financing radical, subversive protest groups around the world with the goal of undermining the established order in a truly Bolshevik-style fashion. During the D.C. protests, vehicles were damaged, storefront windows were broken, and other private property was vandalized. Over 200 of the protesters, many of whom were affiliated with the DisruptJ20 activist organization—a radical, anarchistic group—were arrested for their participation in the violent chaos that consumed the nation’s capital. Additionally, nine journalists, including Wood, were arrested along with the protesters. Seven of the nine journalists have had all charges against them dropped by prosecutors in Washington, D.C. Charges against Wood and Aaron Cantu, a staff reporter at The Santa Fe Reporter in New Mexico, were not dropped despite First Amendment concerns from some of the nation’s leading journalism and free speech experts. Wood has a history of covering protests, particularly during the heated 2016 presidential campaign. On his personal website, Wood notes his history of “documenting social justice issues and resistance movements,” for which he appears to have sympathy. Wood livestreamed his embedded coverage of the Inauguration Day protests and can be heard expressing what seems to be tacit approval of the actions of the protesters, which included breaking windows and spray-painting private property. The Department of Justice, the entity pursuing the charges against Wood, has not commented on the case. “The government has not informed me as to why Mr. Wood’s case involved any greater degree of culpability than any of the other journalists who were ultimately not charged,” Brett E. Cohen, Wood’s attorney, explained to The New York Times. The indictment against Wood and 211 other defendants, originally filed on April 3, “does not single out Mr. Wood for anything arising from the demonstration,” Cohen noted. Lawyers and legal experts have questioned the indictment against Wood and other journalists, arguing that a journalist’s political perspective and personal attitude toward an event they are covering is not relevant from a legal perspective. At the end of Wood’s livestream, police are seen moving in to confront and arrest many of the protesters. Wood identifies himself as a journalist and member of the media documenting the event, yet Washington Metropolitan Police appear to ignore him and eventually arrest and charge him with the same crimes as the radical, violent protesters he was covering. Radical, violent protesters who commit crimes—whatever their political leanings or affiliations—deserve to be punished to the fullest extent of the law, and the federal prosecutors pursuing criminal charges against the radical extremists who targeted Washington, D.C. during Trump’s inauguration should be applauded. However, journalists covering controversial events, regardless of their political leanings and affiliations must be protected by the First Amendment. John Friend is a freelance author who lives in California. I knew about the shills involved to turn a peaceful protest violent. I remember this protest and what they were protesting was forgotten when the broke the peace. Forget it. It’s too late to stop Big Brother. We’re screwed.